RASG: Athame, Spiral Goddess pewter (7 3/4") Pictured left. $80.00 Beautiful athame made of solid, high quality Brittania pewter, with double edged stainless steel blade. Athame hilt is a 3-dimensional archetypal goddess figure with the symbolic spiral on her belly. Hilt is heavy weight, highly polished pewter, and has a very comfortable feel when gripped. 7¾" long. RATHD: Athame Duality Crescent Moon 12" Pictured right. $125.00 Stainless steel double edged blade with a pecan shell resin hilt (cast from a hand carved original) that contains images of the Lord & Lady (one on either side). Hand guard is a dual pair of crescent moons made of pure pewter. A pewter pentacle resides at the center of the crescents, with a faux rainbow jewel in the center of the pentacles. Comes with a black leather sheath; belt clip attached. Measures approx. 12" long. stainless steel blade. Hilt is an Egyptian goddess with a winged scarab comprising the hand guard. Sheath is adorned with hieroglyphic symbols. Measures approx. 12½" long, 13½" long with sheath. RAS11: Athame Winged Scarab 12 1/2" Pictured left. $75.00 Slender Egyptian design, gunmetal pewter finish athame with double edged, kriss-style (wavy edges) stainless steel blade. Hilt is an Egyptian goddess with a winged scarab comprising the hand guard. Sheath is adorned with hieroglyphic symbols. Measures approx. 12½" long, 13½" long with sheath. RBOL: Boline with leather sheath (10") Pictured left. $35.00 Beautifully handcrafted, large boline knife has a bone handle with stainless steel guard & pommel. The curved stainless steel blade is 5½" across with a serrated inside edge & a sharpened outer edge. Comes with a black leather sheath & attached belt loop. Approx. 10" long. RS127: Athame Sword Goddess (20 1/2" long) Pictured right. $28.95 Slender, silvertone mini-sword with ornate accents & double edged stainless steel blade. Hilt is of a carved goddess figure. Sword approx. 20½" long, 21" with sheath. RA198: Athame: Cupid's Pictured left. $15.00 Shaped like a dart from Cupid's bow, with a multicolored wood handle and leather belt sheath which both feature hearts. 10" long. #19 #22 #23 Celtic Replica Letter Openers. Pictured above. $15.00 each. 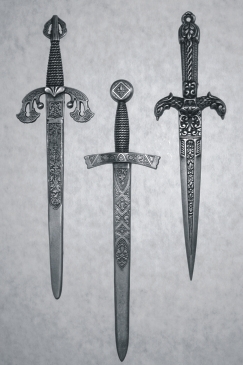 These are designed to be letter openers, but also can be used as an athame. Beautifully crafted of pewter. Custom, one of a kind Crystal Athames by Magical Journey. Crystals used and sizes vary. $175.00 each.